In my November 26, 2006 blog I offered some observations about Thanksgiving. I’m not saying that Thanksgiving more important than Christmas, but with the exception of my years as a child, I’ve preferred Thanksgiving to Christmas for many years. Here are my reasons that Thanksgiving is my favorite holiday. The Thanksgiving message is simple. A child can comprehend the meaning of a prayer of thanksgiving as we sit at the family feast. It is a time to show appreciation to our creator for the physical gifts bestowed upon us. It doesn’t get much simpler, nor does it get much better than this. The Thanksgiving message is for all people. You can be a Jew, Muslim, Hindu, or Christian and celebrate God’s bounty toward you and your family. The message of thankfulness applies to all of God’s people. Thanksgiving isn’t expensive. Unlike Christmas where you might shell out hundreds of dollars on gifts, you need only buy and prepare food for Thanksgiving. I’m not claiming that food is cheap but it is a lot cheaper than the presents you put under the Christmas tree. Thanksgiving is about fellowship and family. Cooking a large dinner is an arduous task, but it is sweetened by the presence of friends and family members who help cook, bring a dessert, or otherwise assist in cleaning up after the meal. Lots of family memories are made at Thanksgiving. Thanksgiving is mostly about gratitude. 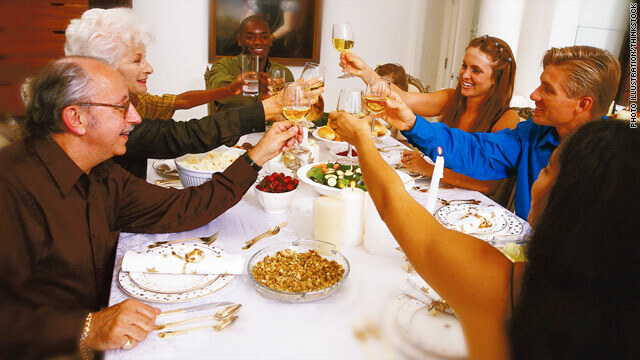 Whether your family watches football, goes on a hike, or just hangs around the house, there is one central event that defines Thanksgiving Day; the meal together and the prayer or statement of gratitude for blessings received. Thanksgiving is mostly about God. At Thanksgiving we are celebrating the harvest and the gifts that we have received. God is central to the Thanksgiving message. It is because of our creator that we eat the meal, gather with family and breathe the next breath. While we don’t give Thanksgiving the attention that Christmas gets, the creator is essential for both holidays. All things considered, I don’t think you can’t beat Thanksgiving. While the Christmas message is most important for Christians, we don’t celebrate Christ’s birth correctly and have lost most of the true meaning of Christmas. Most of us celebrate Thanksgiving properly and the message is brief, but powerful. Have a great Thanksgiving this year! Thanks for the Thanksgiving observations – they’re spot on!!! Happy Thanksgiving to you all. Thanks mickey! you and dan have a great thanksgiving too!